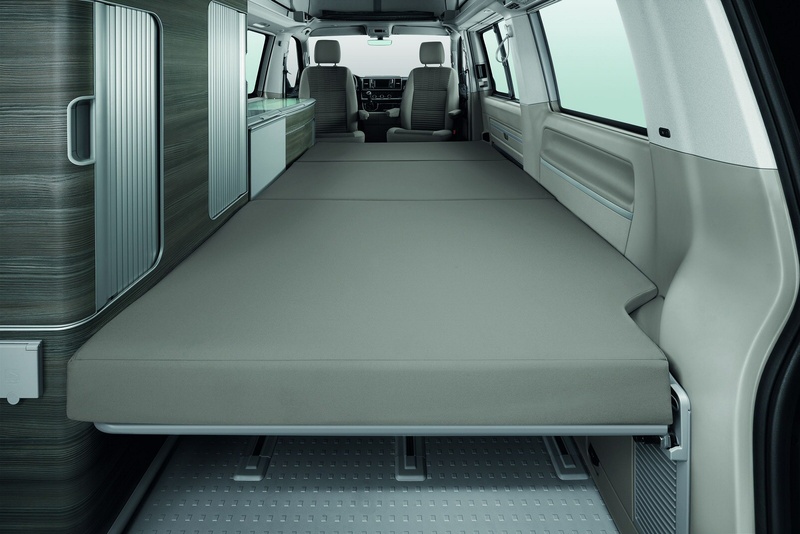 In one sense, Volkswagen's California is a converted van with windows and a few beds in it. In another though, this vehicle could be seen as the key to a whole new life. Let us explain. Let's say you've retired: there are only two of you and you want to travel around the UK and Europe. You don't want the continual cost of having to fork out for accommodation. 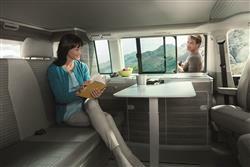 But neither do you want anything as large, clunky and pricey to run as a fully-fledged motorhome. You definitely aren't a caravanning sort of person either. If I've described you, then this is your vehicle. It's car-like for when you just need an MPV. And motorhome-like for when you're travelling. An ideal combination? Let's see. The engine range includes both diesel and petrol options, along with DSG and 4MOTION four-wheel-drive derivatives. Power outputs for UK models range from 102PS for the entry-level 2.0-litre TDI engine you get on 'Beach' models up to 204PS for the 2.0-litre TSI petrol unit available on plusher 'Ocean' variants. As with the Volkswagen Caravelle big MPV model this California is based upon, the cab area up-front is nicely constructed. It features a dash mounted gear stick plumbed into the centre console that frees-up floorspace for better walk-through access to the rear. This configuration shaves vital seconds off the time it takes a parent in the passenger seat to reach the back bench and apprehend a wayward child before they can 'make-over' their brother or sister with a felt-tip pen. The driving position and steering wheel are infinitely adjustable. So much so that, from Kylie Minogue to Giant Haystacks, virtually anyone's optimum driving position is attainable - it's just a matter of finding it. There are armrests on each chair too, along with supportive cushioning and fetching two-tone fabric. When stationary, you turn around the front two chairs to face the two in the rear. 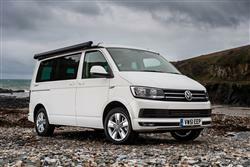 Externally, the California looks like the van with windows that it actually is, the chassis platform also forming the basis for Volkswagen's Transporter T6 panel van and Caravelle people carrier. Inside, California buyers get full central heating - or more specifically a fresh air system with manual air con, a separate timing switch-operated domestic heater for when you're parked up and even a remote radio control for the whole system. Plus there's split-level accommodation comprising of a fold-out double bed downstairs and (once you've opened the electrically elevated section) a bigger double in the roof. For mealtimes, there's a gas cooker with stainless steel sink and drainer and, naturally, alongside the cupboards and ample storage, a fridge. There are also great views all round (particularly if you pull up for the night in the Highlands). Other features include a revised infotainment system, a folding dining table, two folding chairs (stored neatly in the tailgate), a clothes cupboard, blackout blinds and smart draw curtains. 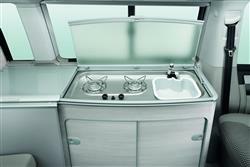 Most owners will also specify the extra cost roll-out awning too. Downsides? Well, the ceiling is rather low and the kind of older people being targeted by Volkswagen for this car will struggle to reach the roof-mounted bed. Younger families meanwhile, will need more than four seats. Most versions of this California model sell from just under £38,000 to just under £55,000 - so it's not cheap. But then hey, you could live in it - for short periods anyway. Available in two forms - 'Beach' and 'Ocean', the California can sleep four occupants courtesy of its acclaimed pop-up roof (electro-hydraulic on Ocean models) that neatly integrates a 1.2m x 2m double bed. 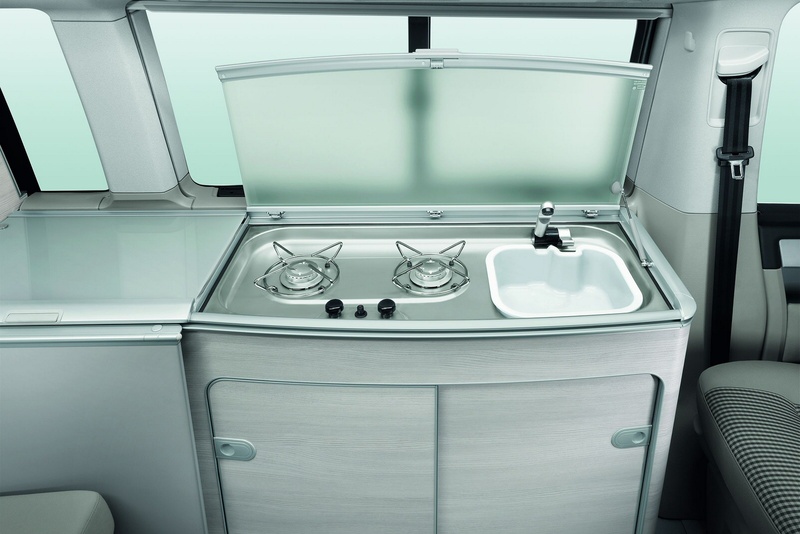 Ocean models also feature a fully-equipped kitchen, complete with 42-litre refrigerator, twin-burner hob and stainless steel sink unit. Ocean models also gain a dimmable LED lighting system for the pop-up roof and tailgate and a clever multi-functional holder for the rear compartment that incorporates a cup, ashtray and towel holder all in one. Driver and passenger safety is another area where the California comes fit for purpose. 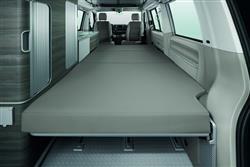 Features include a Driver Alert System, Brake Assist and an Automatic Post-Collision Braking System. Finally, Volkswagen's Automatic Post-Collision Braking System triggers braking after a collision, with the aim of preventing secondary collisions. After a short delay, the vehicle begins a phased braking action down to 6mph, during which the driver can take control at any time. Volkswagen claims that the engines fitted to this T6 generation California model are up to 15% cleaner and more frugal than those fitted to the previous version of this vehicle. Owners of the diesel variants should expect to average over 30mpg on a regular basis. If you�re looking for a new Volkswagen California 2.0 TDI Ocean 204 5dr 4MOTION DSG Diesel Estate for sale, you�ve come to the right place. 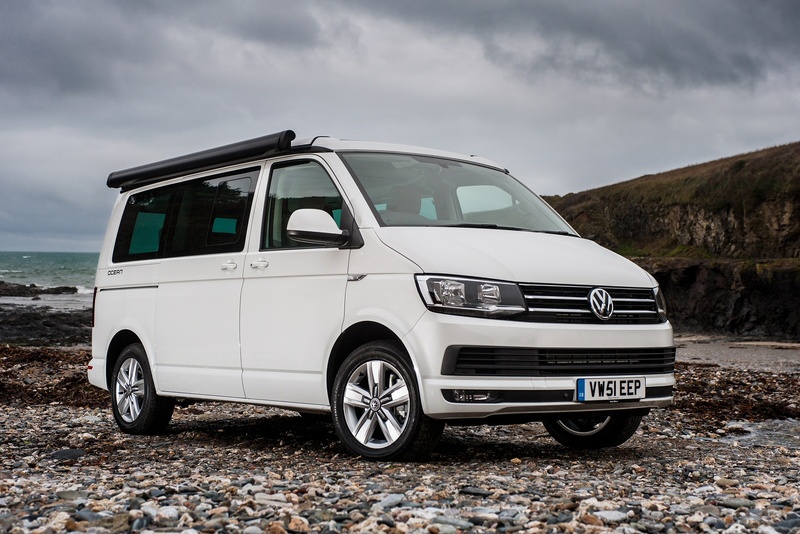 At Bristol Street Motors we don�t just have the best Volkswagen California 2.0 TDI Ocean 204 5dr 4MOTION DSG Diesel Estate deals, we also offer friendly advice and help with all your enquiries to ensure your buying experience is a happy experience.